Twenty-six years ago, the morning of March 14, 1992, I was at a birthing center, giving birth to my daughter, Perri, in Dunedin, Florida. This is what I'm thinking about on my morning snow shoe through fresh, deep snow to the river, under the lovely snow frosted trees. 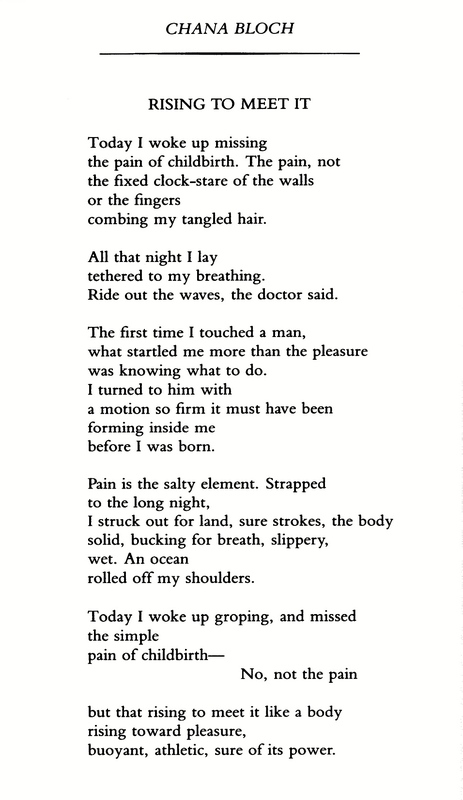 This poem by Chana Bloch I read years ago, and it's been the poem I think about in regard to childbirth since. What I learned about birthing Perri, first, and then my other daughter, Franci five years later, was how pleasurable, not painful, childbirth can be when it's natural, when a mother is prepared and supported, and when she believes in her own power to "rise to meet it." I no longer believe childbirth has to be "painful," and I've shared a point of view with my daughters that's counter to the popularized cliché about childbirth so often depicted in movies and television in our culture: the screaming, swearing, medication craving birthing mother. Because I learned in the birth of my son, my first born, what I didn't want in my next birth – I learned how to employ self-hypnosis to manage my contractions, so that I felt power, rather than pain, in bringing my daughters into the world. This is what I'm thinking as I push my snow shoes through the snow to sun rising on the river: my powerful body, my powerful daughters, my confidence they will have their own exceptional birth experiences some day.